Go to original pattern for design DROPS 130-27. Knitted DROPS jacket in ”Alpaca Bouclé” or "DROPS ♥ You #3". Size: S - XXXL. Bust: 82-90-98-112-120-136 cm / 32 1/4"-35½"-38½"-44"-47 1/4"-53½"
BUTTON HOLES: Bind off for 5-6-6-7-7-7 button holes on right band. 1 button hole = bind off 4th st from mid front, make 1 YO. SIZE S: 5, 14½, 24, 33½, 42 cm / 2",5 3/4",9½",13 1/4",16½". SIZE M: 5, 13, 21, 29, 37, 44 cm / 2",5 1/8",8 1/4",11 3/8",14½",17 1/4". SIZE L: 6, 14, 22, 30, 38, 45 cm / 2 3/8",5½",8 3/4",11 3/4",15",17 3/4". SIZE XL: 5, 12, 19, 26, 33, 40, 46 cm / 2",4 3/4",7½",10 1/4",13",15 3/4",18". SIZE XXL: 6, 13, 20, 27, 34, 41, 47 cm / 2 3/8",5 1/8",8",10 5/8",13 3/8",16 1/8",18½". SIZE XXXL: 5, 12½, 20, 27½, 35, 42½, 49 cm / 2",4 7/8",8",10 3/4",13 3/4",16 3/4",19 1/4". Cast on 76-82-88-100-108-120 sts on needle size 4.5 mm / US 7 with Alpaca Bouclé and work 6 rows in GARTER ST - see explanation above. 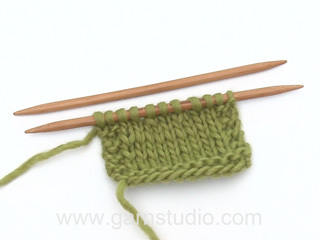 Switch to needle size 5 mm / US 8 and work in stockinette st. REMEMBER THE GAUGE! When piece measures 2-2-2-3-3-3 cm / 3/4''-3/4''-3/4''-1 1/8''-1 1/8''-1 1/8'', dec 1 st in each side. Repeat dec every 2-2-2-2-2½-2½ cm / 3/4"-3/4"-3/4"-3/4"-7/8"-7/8" a total of 5-5-5-5-6-5 times = 66-72-78-90-96-110 sts. When piece measures 15-16-16-17-18-18 cm / 6"-6 1/4"-6 1/4"-6 3/4"-7"-7", inc 1 st each side, repeat the inc every 5-7-5-5-4-5 cm / 2"-2 3/4"-2"-2"-1½"-2" a total of 3-2-3-3-4-2 times = 72-76-84-96-104-114 sts. Continue to work until piece measures 30-31-32-33-34-35 cm / 11¾''-12¼''-12½''-13''-13 3/8''-13¾''. Now inc for sleeves as follows: Inc 1 st in beg of every row 2 times each side = 76-80-88-100-108-118 sts. 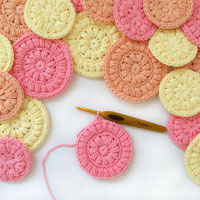 Then cast on 34-33-30-27-24-20 sts at the end of the next 2 rows = 144-146-148-154-156-158 sts. 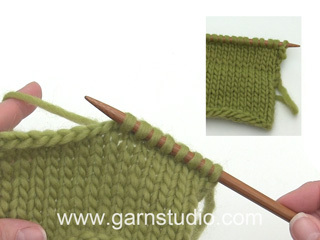 Continue in stockinette st - work the outermost 4 edge sts in each side in garter st for sleeve edges. 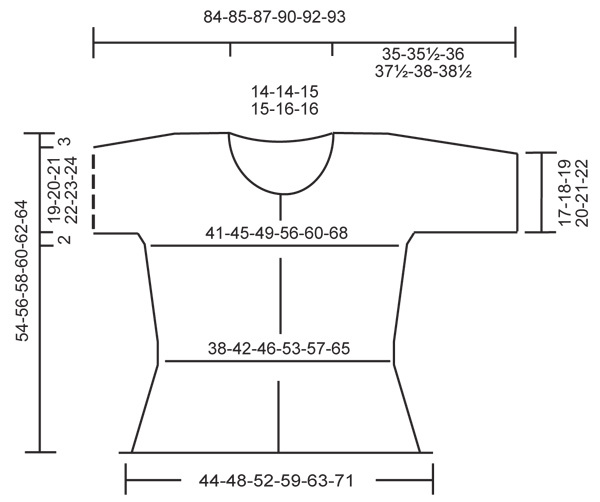 When piece measures 51-53-55-57-59-61 cm / 20''-21''-21 5/8''-22½''-23¼''-24'', bind off for sleeves/diagonal shoulders at the beg of every row in each side: 15-15-15-15-16-16 sts 1 time, 15-16-15-16-15-16 sts 1 time and 15-15-15-15-16-16 sts 1 time = 54-54-58-62-62-64 sts remain on needle. When piece measures 53-55-57-59-61-63 cm / 21''-21 5/8''-22½''-23¼''-24''-24¾'', bind off the middle 24-24-26-26-28-28 sts for neck and finish each part separately - see MEASURING TIP above. On next row bind off 1 st towards the neck = 14-14-15-17-16-16 sts remain for shoulder. Work 2 rows and bind off. Piece measures approx. 54-56-58-60-62-64 cm / 21¼''-22''-22¾''-23 5/8''-24 3/8''-25¼''. 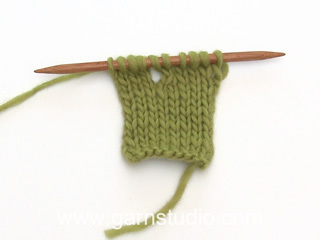 Cast on 43-46-49-55-59-66 sts (includes 5 band sts) on needle size 4.5 mm / US 7 with Alpaca Bouclé and work 6 rows in garter st. Switch to needle size 5 mm / US 8 and continue in stockinette st - with 1 edge st in garter st towards mid front. When piece measures 2-2-2-3-3-3 cm / 3/4''-3/4''-3/4''-1 1/8''-1 1/8''-1 1/8'', dec in the side as on back piece = 38-41-44-50-53-61 sts. Continue to work until piece measures 15-16-16-17-18-18 cm / 6"-6 1/4"-6 1/4"-6 3/4"-7"-7". Now inc in the side as on back piece = 41-43-47-53-57-63 sts. When piece measures 30-31-32-33-34-35 cm / 11¾''-12¼''-12½''-13''-13 3/8''-13¾'', inc in the side 1 st in beg of following 2 rows from RS. On next row towards the side, cast on 34-33-30-27-24-20 sts for sleeve as on back piece = 77-78-79-82-83-85 sts. Continue in stockinette st - work the outermost 4 edge sts on the sleeve in garter st. When piece measures 44-45-46-50-51-53 cm / 17 1/4"-17 3/4"-18"-19 3/4"-20"-21", bind off towards the neck on every other row: 6-6-7-7-8-8 sts 1 time, 3 sts 1 time, 2 sts 2 times, 3-3-3-3-3-4 sts 1 time and on every 4th row: 1 st 2 times. AT THE SAME TIME when piece measures 51-53-55-57-59-61 cm / 20''-21''-21 5/8''-22½''-23¼''-24'', bind off from the side for sleeve/diagonal shoulder as on back piece = 14-14-15-17-16-16 sts remain after all bind offs. Work 2 rows and bind off. Piece measures approx. 54-56-58-60-62-64 cm / 21¼''-22''-22¾''-23 5/8''-24 3/8''-25¼''. Cast on and work as left front piece but reversed. NOTE: bind off for BUTTON HOLES on front band - see explanation above. Sew the shoulder seams. Sew side seams and under sleeve in front loop of outermost st to avoid chunky seams. Sew on buttons. NECKLINE: Pick up approx. 70 to 80 sts from RS around the neck on needle size 4.5 mm / US 7 with Alpaca Bouclé. Work 4 rows in garter st. 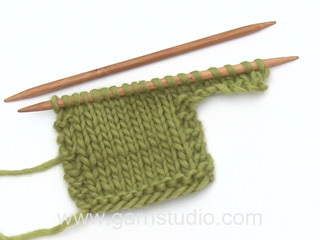 Loosely bind off. BACK PIECE: ....On next row bind off 1 st towards the neck = 14-14-15-17-16-16 sts remain for shoulder. Work 2 rows and bind off. Piece measures approx. 54-56-58-60-62-64 cm / 21¼''-22''-22¾''-23 5/8''-24 3/8''-25¼''. LEFT FRONT PIECE: ......When piece measures 44-45-46-50-51-53 cm / 17 1/4"-17 3/4"-18"-19 3/4"-20"-21", bind off towards the neck on every other row: 6-6-7-7-8-8 sts 1 time, 3 sts 1 time, 2 sts 2 times, 3-3-3-3-3-4 sts 1 time and on every 4th row: 1 st 2 times. AT THE SAME TIME when piece measures 51-53-55-57-59-61 cm / 20''-21''-21 5/8''-22½''-23¼''-24'', bind off from the side for sleeve/diagonal shoulder as on back piece = 14-14-15-17-16-16 sts remain after all bind offs. Hallo Dineke, Je kant aan beide kanten van de schouders af is 2 maal 3 x 15, dus in totaal 90 steken en dan kom je op 58 steken uit. 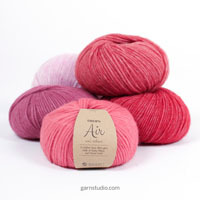 Deze gemaakt in het roze (Alpaca Bouclé) en het is prachtig!! Ook heel tevreden over de levering en de kwaliteit van het garen. Echt top! Ik begrijp het stukje over de 5 st. voorbies niet (voorpanden). In welke steeksoort moet de bies worden gebreid (indien het gewoon tricot is noem je het geen voorbies, toch?). Dank u wel. Ik hoor het graag. Hoi Misscha. Je breit alle st in tricotsteek - ook de voorbies. En het heet een voorbies - ook is die niet duidelijk te zien met bijvoorbeeld een andere steek. Hej. När du har 88 m lägger du upp ytterligare 30 m på varje sida (i strl L) då har efter det 148 m totalt. Lycka till! Ok tak for svaret Drops ;-) Det en meget simpel opskrift, og glæder mig til at blive færdig med den. Jeg vil rigtig gerne strikke den her, men jeg har noget helt almindeligt 100 % bomuld, kan jeg strikke den i det istedet for det garn der bruges i opskriften og istedet for det som I nævner i Garnalternativer ? Jeg er ikke rigtig klar over om stolpemasker er de masker der bliver strikket knaphuller i, altså forkanter. Er det forstået rigtigt? Hej Bente. 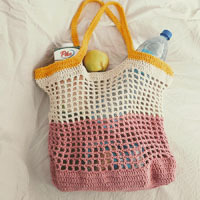 Ja, det er dem du skal strikke knaphullerne i.
Hallo, Ich würde dieses Modell gerne mit langen Ärmeln in Größe M stricken. Würde dafür 400g reichen? Und wo muss in der Anleitung dann welche Änderung vorgenommen werden? Liebe Frau Sund, leider können wir Ihnen an dieser Stelle keine Anleitung für längere Ärmel anbieten. Für Hilfestellungen lassen Sie sich am besten in Ihrem Wollgeschäft beraten. Hej Annette. Du har 5 forkantmasker (det er til stykket hvor du har knapper/knaphuller). Du strikker dem i glatstrik UNDTAGEN den förste m (kantmasken), den strikker du i retstrik.